With Shaun the Sheep currently making his big screen debut in cinemas, we were lucky enough to be sent a couple of DVDs recently by Studio Canal - including one featuring our favourite woolly-navelled hero himself. "Shaun the Sheep - Flock to the Floor" from Aardman Animation Studios is the latest home DVD release of Shaun's adventures. Get on your best disco gear and hit the dance floor as Shaun and pals get their groove on. And if, like me, you still remember Morph from the days when he used to pop up on Take Hart, you'll be tickled to know that you also get 5 exclusive new Morph episodes to watch as well! YAROO! Sticking with nostalgia for a moment, remember those cute little busy folk The Doozers from Fraggle Rock? They're now stars of their own animation series, specially for younger viewers. 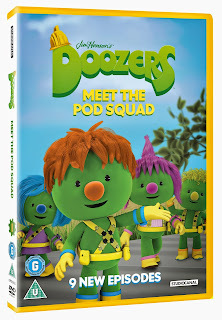 Join the Doozers in a whole stack of adventures, solving problems through teamwork, engineering and having tons of fun doing it (We really love all the crazy little vehicles the Doozers trawl around in!) 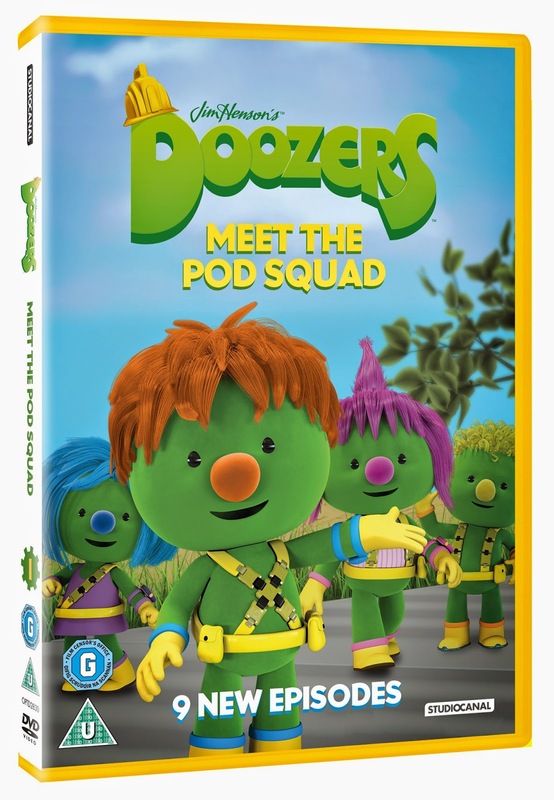 Meet the Pod Squad: Spike, Molly Bolt, Flex, and Daisy Wheel as they design, create and innovate - and inspire your little 3-6 year olds to get busy building their own crazy contraptions too. "Shaun the Sheep - Flock to the Floor" and "Doozers Volume 1" are out now from all good retailers. So what's occuring in children's chapter books this month? We all love a good superhero tale - particularly when it's a squidgy squishy squirrel-based hoot. "Squirrel Boy vs the Bogeyman" by Dave Lowe follows in the comic footsteps of awesome authors like Roald Dahl and David Walliams to conjure up a new breed of superhero. He might not be able to fly, he doesn't have a cape, and his outfit leaves a lot to be desired but Walter Kettle AKA Squirrel Boy is our last best hope against the most nefarious menace known to mankind. Bogeymen! Thanks to a visit from a radioactive squirrel, Walter can become Squirrel Boy every time he eats a nut. But his arch nemesis, Jeremy Winkleman-Grubb has radioactive talents of his own. What's going to happen when the two engage in a climactic battle? Can squirrel overcome snot? 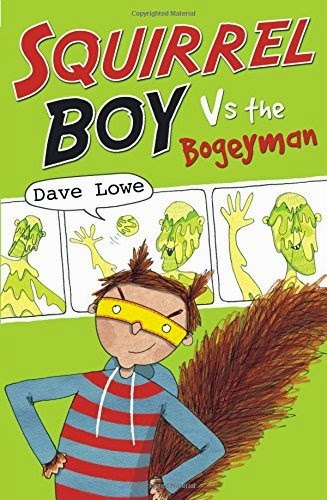 We're not going to spoil the story for you, but track down a copy of "Squirrel Boy vs the Bogeyman from Phoenix Yard Books and watch out for more from this series very soon! Dan Scott's awesome "Gladiator School" series is now up to book six, and the series goes from strength to strength. Chock full of atmosphere and history, Gladiator School brings together Lucius and Quintus, two brothers enrolled in the toughest school in Rome. Training for the arena, for combat and for strength, Lucius and Quintus struggle to survive under the watchful eye of the harsh Crassus, a combat-hardened gladiator trainer as grizzled as a pit-bull. Dan's stories are superbly immersive and chock full of action as well as a ton of facts and figures for your own little Rome fans. 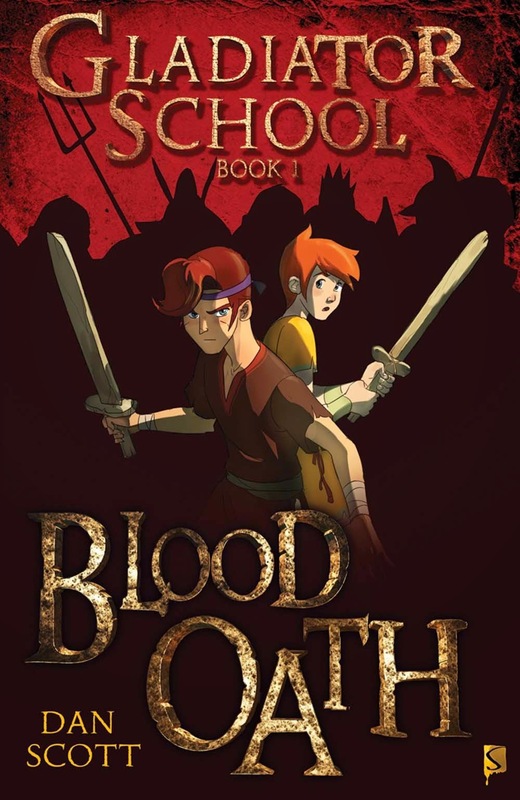 We took a look at Blood Oath and Blood Justice (book 6) but you can find out a lot more about the books on the Scribo website. Science is magic by any other name to children, and for some kids the scientists behind some of the most astonishing theories and discoveries of the last two centuries are like magicians. Most will learn a good dose of science early on in school but others (like Charlotte) will have their curiosity piqued enough to demand gorgeous books like these, that celebrate scientists in a language kids can understand, with dazzling visuals to knock their socks off too. "Rebel Science" by Dan Green and David Lyttleton celebrates scientists who may be more renowned for being a bit maverick, a bit more "out there" with their ideas but true scientific pioneers in their particular fields. 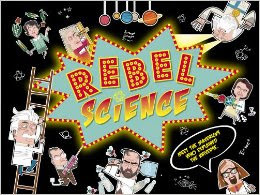 We instantly fell in love with the presentation of "Rebel Science" that dishes up gorgeous double-page-spread after double-page-spread of facts and figures, mad experiments, crazy theories and of course most importantly the personalities behind some of the world's greatest scientific discoveries. It does so in a slightly cheeky and irreverent way, but I think the likes of Einstein, Newton and Curie would probably quite like it that way! We couldn't resist a bit more research into some of the awesome scientists detailed in this book, but I think Charlotte was genuinely disappointed in a couple of cases, to find out (in her own words) that "most of them look old fashioned and ordinary! Not like in the book!" "Rebel Science" is out soon from Templar Publishing. Whack on your lab coat, grab a couple of test tubes and DO SOME SCIENCE! Charlotte's best bit: Rather too much grisly enjoyment of passages detailing pioneers who chopped up poor folk to discover more about the human body! Daddy's Favourite bit: A rocktastic rap-battling celebration of cool science deliciously presented and wonderfully illustrated. It's blinding us - WITH SCIENCE! Those snooping snafflehounds are back for another globetrotting adventure, this time finding themselves not lost in London, but at large in the U S of A! Jack and Deputy Poco Loco return for a fourth outing and this time they have a new friend in tow. A wonderful little Opossum called Penelope who literally drops in on the pair, lost and a long way from home. 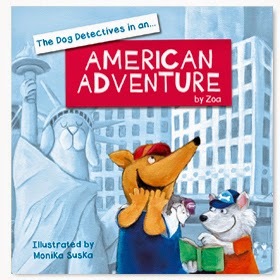 But never fear, the dog detectives are on the case - with Jack absolutely sure he knows a short cut back to Penelope's New York home. Thus begins a caper across a continent as Jack and Poco Loco's navigational skills and local knowledge of short cuts is put to the test. It's a jolly good job Penelope doesn't have to be home in time for tea! It's a fantastic excuse to get to know more of America and the amazing cities and landmarks you can find across the pond. Huge fun for kids who love exploring and finding out about other cultures and countries. Just never ever stop to ask Jack or Poco Loco for directions if you're lost! Charlotte's best bit: Vegas, baby! Vegas! Daddy's Favourite bit: A continent-spanning caper that cracks along at a fair old pace! Most of us (and most of our children) at one time or another must've had a special blanket, cuddly toy or trinket that never ever left our sides when we were tiddlers. Mine was a scratty nursing blanket which was called "My Cuddle", my little brother had something called "Blankie" (a piece of brightly coloured fluffy material) and Charlotte used to have a little lambswool blanket. I've heard tales from parents of what happens when those beloved items go missing, and children absolutely refuse to accept a replacement (or worse still, tales of children throwing three day long tantrums if those items are ever washed). I wonder if this was the inspiration for Roo the Roaring Dinosaur by David Bedford and Mandy Stanley. Roo doesn't exactly look like the sort of dinosaur who throws his weight around, roaring willy-nilly and bothering the local animals. Roo, in fact, is a tiny wee mite who has a precious blanket called his Moomie. Roo and his Moomie are inseparable, until one day a visitor crashlands on Roo's island in a hot air balloon. The new visitor is a big and friendly woolly mammoth who quickly becomes a firm friend. But all too soon playtime is over, and the mammoth needs to get back home. Can Roo possibly give up his most treasured possession so that his friend can get home? There are some wonderful scenes in this, quite touching in fact. Charlotte was initially quite bullish about the fact that this was a "Baby book, not for me" but when we settled down to read it (as we do with all the books we get sent, regardless of whether madam thinks they're 'baby books' or not), she snuggled down with me and our big Canadian horse blanket, cuddled close and fell quietly in love with this cute little story. Oh - the roaring bit. Remember we said Roo doesn't do a lot of roaring? Read to the end of the book! 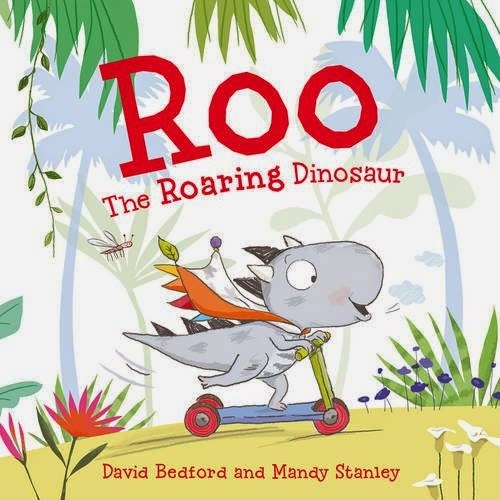 "Roo the Roaring Dinosaur" is out today, hooray! Charlotte's best bit: Charlotte was initially not a fan of this, until we settled down for a good few reads through. She really loved Roo's particular way of speaking - toddler speak! Daddy's Favourite bit: A wonderfully subtle and touching tale of friendship - oh and those utterly precious items that kids absolutely can't stand to be separated from. A lovely little Dino tale! Yay! It's time for another book in Julie Fulton's awesome "Everso" series, depicting the strange characters and comings & goings in Hamilton Shady. It's a crazy town and there's always something going on. Not the place for a peaceful holiday. Even more so as we meet the latest character dreamed up by Julie and ace illustrator Elina Ellis. 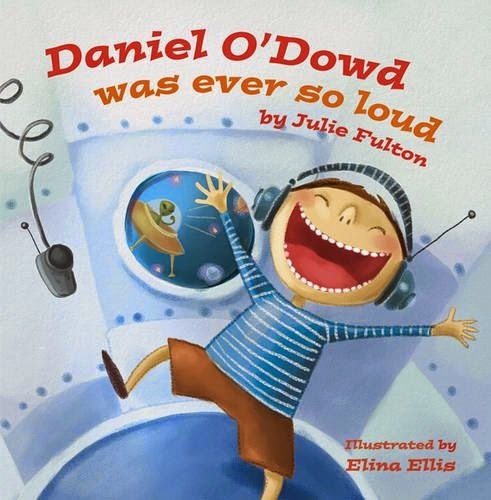 Daniel O'Dowd might look like a fairly ordinary boy, but like most boys he really isn't the quietest little dude. In fact most of the residents of Hamilton Shady need to walk around with cotton wool in their ears when Daniel is around. The town is in peril though! Out in the dark reaches of outer space, a gigantic asteroid threatens to collide with earth, wiping out Hamilton Shady in the process. Could a loud-mouthed boy possibly save the world? "Daniel O'Dowd was Ever So Loud" is out today from Maverick Publishing. Today sees the launch of a book we've been enjoying as a preview from Netgalley, now released in hardback and paperback by Curious Fox for the UK Market. 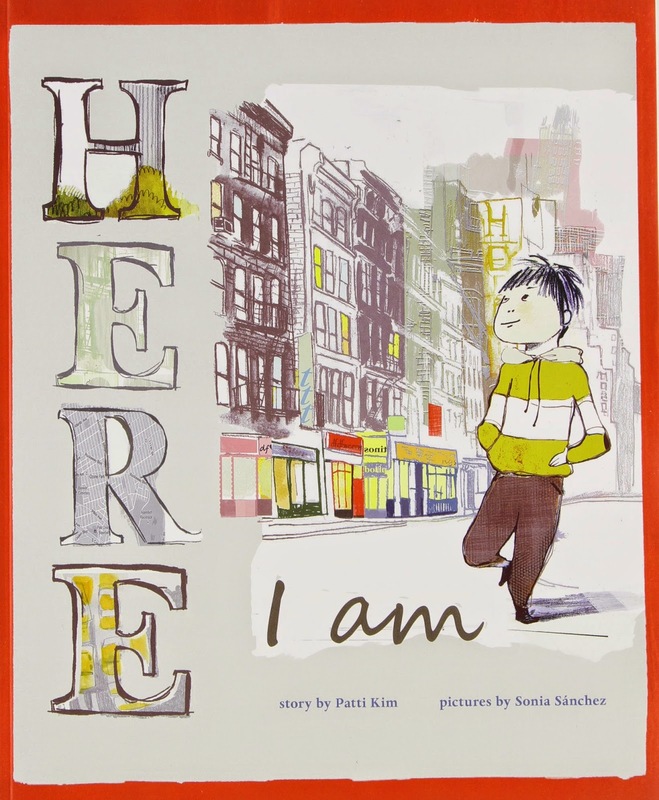 "Here I Am" by Patti Kim and Sonia Sanchez feels like a child-friendly graphic novel, designed to be wordless and approachable - and speaking to children in a universal and visual language that fits the story's content perfectly. A young boy and his family arrive in a new country, moving home lock stock and barrel. As you can imagine, moving to a foreign country can be scary enough for adults but for children there are a million and one questions - and just as many new experiences, sights, sounds and culture shocks to cope with too. The boy in the story finds life tough in his new home at first, but clings to a magical seed that explodes with light and colour when he cradles it in his hand. One day the boy spots a young girl playing outside his apartment, and as he stretches out of the window to take a closer look he drops his beloved seed, and the girl finds it and makes off with it! Will the boy ever find the seed and the girl? The tale unfolds delicately with Sonia Sanchez's expressive, energetic and vibrant visual style fitting Patti's wonderfully observed tale perfectly. It's actually so good to see this in print in its final form as we loved it as a digital book, but really love it as a book to dive into at our leisure - each time finding new things to look at and talk about just as you'd imagine the young boy does as he encounters all the new things in his new environment. Fantastic, inclusive and thoroughly enjoyable. Charlotte's best bit: The boy and his seed, and the wonderful colours that explode from it whenever it's cradled and sung to. Daddy's Favourite bit: A really fantastic book for children of all nationalities, perfectly pitched and beautifully paced. To respectfully mark Holocaust Memorial Day today, we've been taking a look at a couple of Usborne's Young Readers range, specifically designed to tackle the terrible atrocities in a way that will deeply involve children who want to find out more. Starting with the Usborne Famous Lives series, and the remarkable story of Anne Frank, a young Jewish girl forced into hiding as Hitler's Nazis invaded Holland. 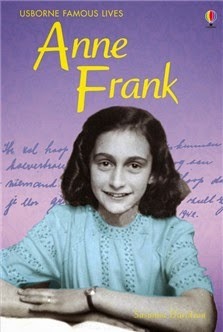 We learn Anne's story through her diary and the preservation of her memory by her father who survived the concentration camps only to learn of the fate of his wife and daughters after the second world war. Usborne's documentary account of Anne's life and death is sensitive and informative, and though it was quite tricky to take Charlotte through the book because of the disturbing nature of Anne's story, we persevered purely because the book helps answers all the questions she raised and more - and there's no reason not to use this book as a valuable resource when children learn about Anne's story at school. 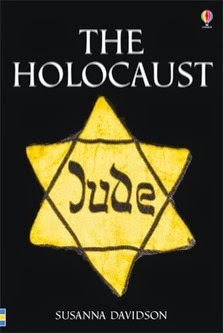 The second book, "The Holocaust" by Susanna Davidson is similarly involving, expertly devised and also deals with some incredibly dark subject matter in a way that will educate children, speaking on their level. "The Holocaust" describes the rise of the Nazi regime and the final solution, and the colossal impact on the world of this heinous plan. This was trickier for us to go through as there are harrowing images and descriptions of how the Nazis slowly put their plans into action. Usborne can always be trusted to publish thoroughly well researched and fantastic informative non-fiction titles, and these are no exception. This is a book that has eluded us for so long but we've finally caught up with it, hooray. We love books that celebrate books, that celebrate that wonderful feeling when you immerse yourself in a story so deeply that you find yourself thinking about it later, hear yourself gushing about it to others, and get a sort of tingly thrill whenever you spot a copy in a book store or library, or tucked under someone else's arm. That's how we feel about "The Fantastic Flying Books of Mr Morris Lessmore". It was worth the wait. Morris is a lovely character, who has a wonderful book collection crammed into his modest home. One day after a terrible storm, Morris finds his beloved collection trashed, and wanders the devastated landscape lost and folorn. Folorn is an expression Morris does so well. He's part-based on the looks of Buster Keaton so his doleful puppy-dog eyes make us sympathise with his plight (not to mention the fact that the poor fellah loses a whole stack of books). Thankfully as he wanders the land, he spies a lovely young girl flying off into the sky, being tugged aloft by a whole flock of flying books. Anxious to find out where these books came from, he follows them to their roost, the most amazing library crammed with these friendly tomes (needless to say, we completely fell head over heels for one little book that's cleverly designed to look like a happy little Humpty Dumpty). Morris spends the rest of his life reading stories, listening to them, caring for the books until he becomes old and frail and lets the books read themselves to him. 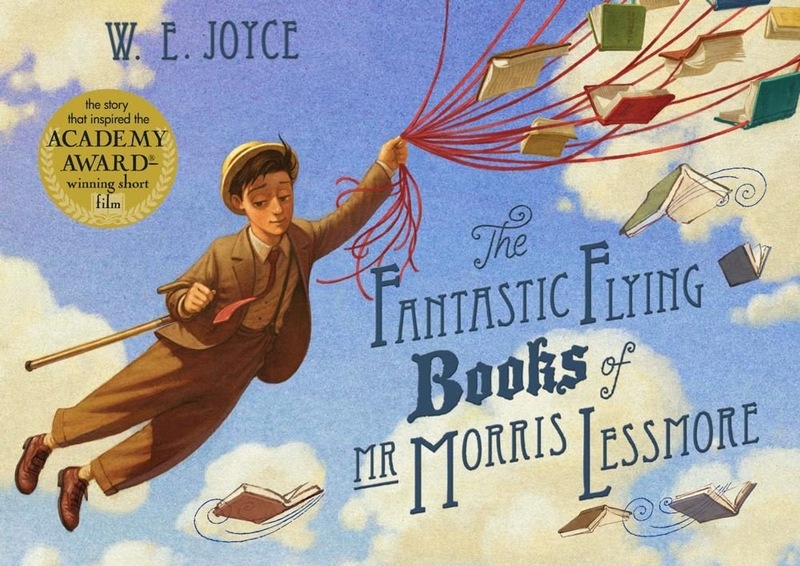 Soon it's time to move on and our story begins anew as Morris is taken aloft, just as the young girl was before - leaving a legacy of stories including his own. The book is so delightful and so easy to become immersed in. We'll be picking up a copy of our own, and tracking down the animated feature based on the book too. In the meantime, if you're searching for an inspirational and celebratory book about books, this should definitely be your next port of call. Charlotte's best bit: At the end of the story, a young girl very like Charlotte follows in Morris's footsteps. A lovely moment as she discovers Morris' story for herself. Daddy's Favourite bit: A glorious story, the most gorgeous art style, and a heart-meltingly touching homage to our most favourite thing, a durned good book. You know we already fell in love with Chris Riddell's Goth Girl. Ada Goth is the sort of children's book character that you just can't help falling in love with and though we're late to the party with her second adventure, we're hugging ourselves with glee at how great "A Fete Worse than Death" is. One person - or should that be one bear isn't quite as excited about the garden party as Ada and her newly found friends, the Attic Club. Marylebone the Bear (wink) - Ada's Maid in Waiting, is rather more concerned with matters of the heart. A mysterious marriage proposal has sent the normally erudite bear into a tailspin. It's up to Ada and her pals in The Attic Club to lend cupid a helping hand, while avoiding the steely gaze of the nefarious indoor gamekeeper Maltravers. Charlotte and I had to toss a coin to see who would get to read this first (I did the decent thing in the end and let her read through before stealing off with it). It's a sign of a great book that we are still giggling about it, and while discussing all the best bits, each of us got a batch of different story experiences from our read-throughs. Chris is a genius, creating a set of stories that are not only cross-generational (Charlotte knows enough about bake off to find Chris's amusing refs funny, while I can really dig all the nods to classic gothic and children's fiction). This is so good, and now thanks to our lovely pal Anne-Marie over at child-led chaos we know that a third book is on the way, this time taking a wry poke at the beloved Brontes. We absolutely cannot wait! 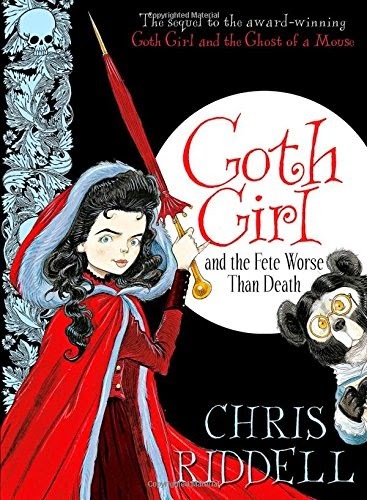 "Goth Girl - a Fete Worse than Death" is available now from HarperCollins Children's Books. Do NOT miss it! Charlotte's best bit: Her sheer and utter delight at the cake tasting! Daddy's Favourite bit: So many genius observations, comic nuances and lovingly written tongue-in-cheek references that beg you to dive straight back in for another read through once you reach the end. Particularly loved the Nigella Lawson-alike though, oh yes! 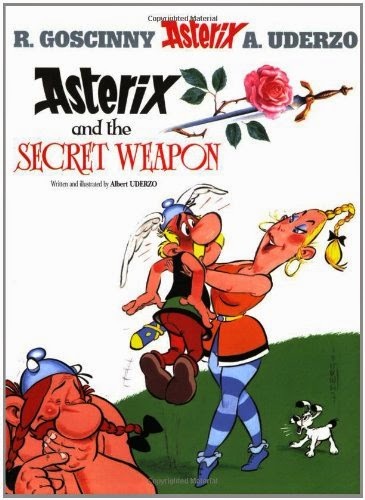 France's mightiest hero, and his loyal sidekick - how can we possibly resist Asterix and Obelix. I've slowly been introducing Charlotte to the amazing adventures of the awesome Gaul warrior. But here's a story with a difference. Can Asterix and Obelix have met their trickiest foe yet? A wandering bard comes to their humble village. A female bard with enough sass and cheek to inveigle her way into the tribe with very little effort. She takes a shine to Asterix but he's not sure she can be trusted. But can she be the key to defeating Caeser's latest secret weapon? I always used to think the Asterix books were really full-on and busy, with hugely complex layouts packed into every page spread. The stories are meaty though, and for kids who are looking to get into longer and more involving stories, Asterix books are truly awesome (and hilarious too!). Bit of a shocker part way through this story when Asterix does something that you really really would not expect to see our gallant hero doing (I skipped rapidly past that bit when reading to Charlotte - even in the context of the story). We've previously enjoyed Asterix and Cleopatra and with 33 more books to check out, we'll definitely be going back to the library for more. Charlotte's best bit: Caeser's secret army of...aww we won't spoil it for you but wowsers, that's some army! Daddy's Favourite bit: I actually think Obelix is the real star of this particular story, subtly stealing just about every scene effortlessly. You'll see what you mean when you read it. Andi Watson's fantastic mighty girl superhero is back for a 4th outing and though it's taken us a while to get round to picking this up, we thought it was about time we reacquainted ourselves with Grace and Catastrophe High. We love Gum Girl and can't wait for the next instalment. Don't make us wait too long! Charlotte's best bit: She was overjoyed when Pigment P's little dog changed sides to join Gum Girl instead! Daddy's Favourite bit: "Ew, someone's sweated into this mask!" - Genuinely laughed out loud at that line! We love a good doggy yarn, and we love a cheeky tweak of the royal cheek as well so when the two are combined, we know we're in for a treat. Meet Chips - the royal dog with a difference. Most of the Queen's corgis are content to laze around, eating only the finest foods and chewing on the most exquisite chew toys. But Chips prefers slightly chewier (and stinkier) fare. 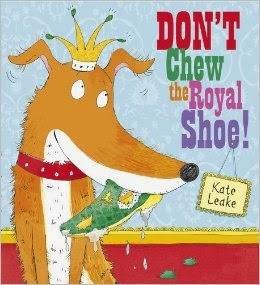 There's nothing nicer to gnaw on than the royal shoe collection. Chips is a very thoughtful dog, if a little naughty. He only takes a single shoe at a time, and carries them away to a secret hidey-hole to chew at his leisure. Chips' behaviour doesn't go unnoticed. It's a dashed bad show don't you know, and the Queen issues a royal order - the missing footwear must be found! Chips looks set to spend his days firmly in the doghouse until one night, a burglar steals into the palace to make off with the royal jewels and silver. A burglar with a big stinky pair of smelly (and very chewy) boots. Can Chips possibly save the day? Kate Leake's book is huge fun and though Chips is a bit of a shoe-scoffing scoundrel, we couldn't help but love him to bits! 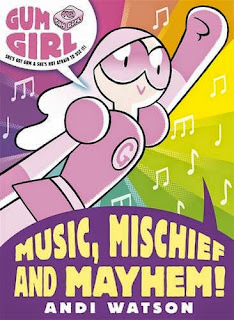 Don't miss Kate's first book for Scholastic / Alison Green Books, out now! Charlotte's best bit: Charlotte was amused (and slightly horrified) at the thought of Chips enjoying the Princess's 'nice and crunchy' glass slippers. "But won't he cut his mouth?" Colin McNaughton is one of our book heroes, tickling our funny bones with absolutely everything he writes and draws. "Good News, Bad News" is a bit of an old classic but we were absolutely delighted to find a pristine copy nestling amongst the library stacks. So how could we possibly resist it? 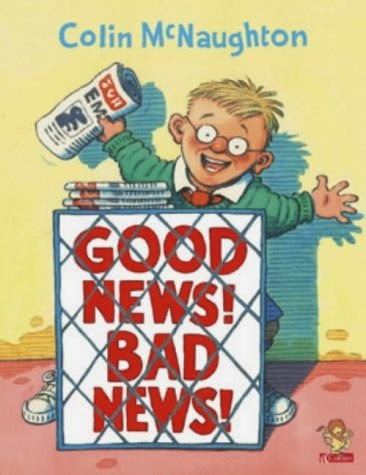 "Good News, Bad News" starts off with an ordinary little boy (who we think looks eerily like a young Chris Evans) starting off his day as most little boys do. The bad news is, it's time to get up for school! Good news is that there's no school today! Hooray! Bad news though, it's time for a trip to the dentist! The boy's day is a rollercoaster ride of good news and bad news from then on. He's mobbed by a bunch of nasty girls (ew!) he's rescued by aliens, but the aliens pong like stinky nappies! EESH! And so the day goes on, with hilarious consequences at the turn of each page. There's a bit of repetition in this story but it's another classic, so if you do ever spot a copy tucked away in a secondhand book shop (we think it's sadly out of print now, awww!) or as we did, in your local library, grab it and giggle along with us! Charlotte's best bit: Charlotte sagely pointing out that the boy in the story looks like one of her classmates, and he too gets mobbed by the girls (including Charlotte!) - I genuinely feel sorry for the poor lad! Daddy's Favourite bit: A hilarious hoot, Colin is such a talented fellah and we've never met a book of his that we didn't like! Izzy could almost be Charlotte! The pint-sized central character of this hugely entertaining and utterly gorgeous to look at Book of the Week can't sit still for more than five minutes, just like Charlotte. She fidgets, fiddles, wriggles and squirms. She's always tapping her feet, dancing around, and we often describe her as having ants in her pants. So what happens when fizzy busy Izzy goes to the Zoo with her exasperated teacher (who we LOVE btw, purely for her hilarious hang-dog expressions in this) and her classmates? Mayhem ensues because Izzy just cannot resist interacting with the animals in her own unique way. Tapping on tortoises? Egad! Mocking monkeys? Gadzooks! Charlotte was very quick to point out that children wouldn't *really* do dangerous things like that in a zoo but I gently pointed out that what happens in bookworlds is always a little bit magical and special so we're willing to let Izzy get away with most of her behaviour. But there's just one thing you should never, ever, EVER do! Never tickle a tiger! Pamela and Marc are such a dream team. Pamela has a gorgeous gift for making us cackle our heads off at her character's crazy antics (we loved her Stinkysaurus books and Santa Claws was a huge favourite at the end of last year too!) 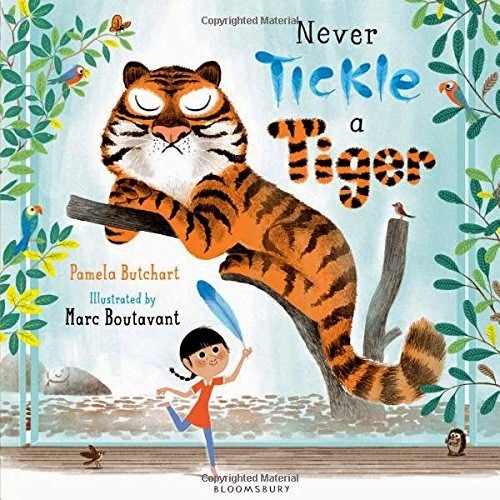 Marc Boutavant's illustrations tap into that glorious golden age of American children's literary styles where bright colours and retro-style characters add tons and tons of fun to Pam's brill story. Izzy leaps, fidgets and wiggles across every frame (and Charlotte loved her little Hedgehog 'shadow' who seems to pop up in all sorts of places throughout the story. We've probably said it so many times already but 2015 really is shaping up to be every bit as good, if not better, for children's books than 2014 was! Glorious stuff, do not miss it! "Never Tickle a Tiger" arrives on Feb 12th from Bloomsbury Publishing. Charlotte's best bit: Chaos ensues as the impact of Izzy's mischievous actions unfolds (quite literally) in front of your child's eyes. Calamitous, crazy and so hilarious! Daddy's Favourite bit: One of those delicious books that pleases on all fronts. A hoot to read aloud, a great entertaining story, utterly glorious illustrations and one you'll want to leap right back to the start of and read all over again when you're done. Brilliant! Laurent De Brunhoff's Babar books are utterly fabulous. Picking up the stories after his father's untimely death at the age of 37, Laurent continued making Babar the awesome and timeless character we've come to know and love. This story is an absolute corker, dealing with a particular story theme that children absolutely can't resist. Babar and his family are forced to stay in an abandoned castle one stormy night, and as they settle in something seems a little odd about the place. Wise Babar states categorically that ghosts don't exist, so everyone gets some well needed sleep. But there's definitely something else stalking the castle corridors - a ghost! Babar's children and their cousins can all see the ghost quite clearly, and the ghost isn't just content with rattling a few chains or tipping over suits of armour. This ghost is very naughty, and likes showing off! Surely trouble can't be far behind! All our favourite characters crop up in this story, but the real star is the ghost - who might just mend his naughty ways with the right incentive after all! 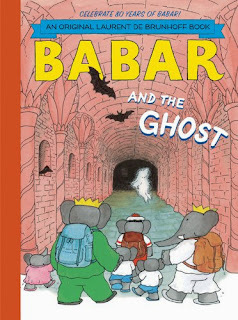 Definitely one of our favourite Babar stories and such a happy discovery! Charlotte's best bit: The naughty ghost speeding through the town in a stolen car! Daddy's Favourite bit: A timeless character, utterly brilliantly picked up by Jean De Brunhoff's son after his father's untimely death. This particular tale is a corker, tapping into children's love of characters that they can see but adults can't. 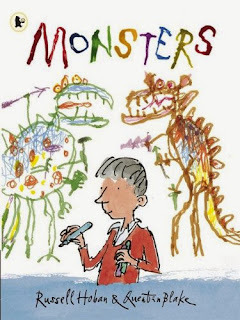 Quentin Blake is such an astonishing AND prolific talent it's almost impossible to keep up with his books, but we aim to try - and this superbly dark tinged story sprung on us by surprise. Tucked into the library stacks, we hadn't encountered it before but absolutely had to take it home with us. "Monsters", written by Russell Hoban and illustrated by Sir Quentin himself, is the seemingly simple story of John. John is almost like every other boy but there's one thing John loves more than anything else. He loves to draw monsters. Thin ones, fat ones, horrible ones, cute ones - Monsters of all shapes and sizes. John's Mum and Dad are a bit perplexed but wonder if a chat with a friendly doctor might not go amiss. John then begins an amazing new work of art - on a huge piece of paper. Piecing the whole picture together one tiny tantalising bit at a time, it's obvious that John is working on his most incredible masterpiece yet. John's parents are intrigued. John's doctor is perplexed but wants to know how the image is going to turn out. We won't reveal the deep dark twist at the end of the book but it's really quite something, and the ending left Charlotte wanting to know more - and with a myriad questions about what John actually did! Russell's observations of child behaviour are incredible - his keen eye makes this an essential read, but there's a serious message tucked into this wonderful story, crossing the line between a celebration of a young boy's active and focused imagination and the psychology of how children like John interact with the world around them and other people (including their nearest and dearest). It's hugely thought provoking stuff, don't miss it! Daddy's Favourite bit: A book with real layers of acute and expert observation of child behaviour from Russell, raising almost as many questions as it answers and all wrapped up in Sir Quentin's illustrative expertise. Heck of a book! Like this? We think you'll absolutely LOVE these too! 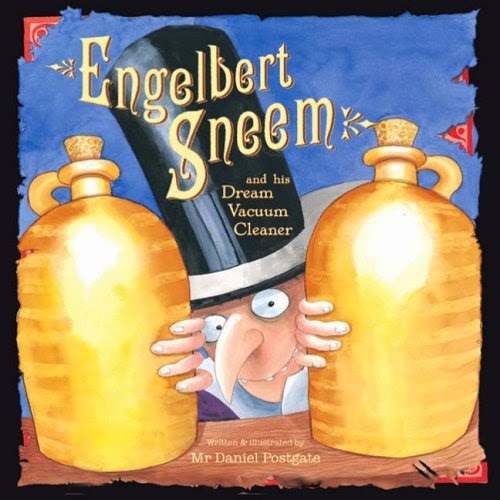 What a strange character is Engelber Sneem! A talent, a dancing prancing inventor but with a dark secret - He covets your dreams and mine! Daniel Postgate's crazy creative character is the star of this dark tale of the invention of a strange machine designed to harvest our innermost thoughts while we sleep. We couldn't wait to see if Engelbert would get away with his terrible plan - which backfires quite spectacularly! Will Engelbert Sneem ever learn his lesson? It's a fun and original romp for sure! Daddy's Favourite bit: We love an odd book that squeals originality from every page and this sure does that! Before the awesome Phoenix Comic hit shelves, The DFC featured a huge chunk of the talent who regularly contribute to "The Pheen" as it's affectionately known at ReadItDaddy Towers. Charlotte was too young to be into comics, and it seems astonishing to think that the DFC folded when the quality of strips and contributions was so amazingly high. Here's a good example of why the DFC was fantastic - in one of the best strips featured in that hallowed and sadly departed mag. "Mo-Bot High" tells the story of Asha, a girl arriving at a new school to find that things aren't quite as they seem. Like every school there's a clique to get in with, a bunch of no-good bullies who delight in making people miserable. But unlike any other school, Asha's new seat of learning has a hidden secret. Each and every day the pupils get to play with possibly the most awesome thing on the planet - gigantic holographic mech robots summoned from their mobile phones. Welcome to Mo-Bot High! Asha's first day doesn't run smoothly as she instantly falls out of favour with one of the bullies, and ends up challenged to a Mo-Bot scrap the next day. Asha can't practice or train outside of school (Mo-Bots only work on school premises, y'see! What a shame - can you imagine how handy they'd be on the weekly supermarket run?) Can she somehow work out the intricacies of controlling a giant holographic robot before getting terminally frazzled by her new-found enemies? 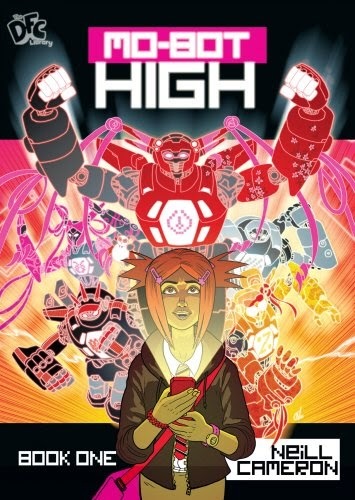 "Mo-Bot High" sets the scene for Asha's story and world perfectly, but then snatches the rug out from under you as you realise that book 1 is all there is (Wahhhhh!!!) so it's a tantalisingly sweet insight into a comic series that cruelly never got the chance to bloom beyond this initial outing. But hey, you never know - those Mo-Bots might make a reappearance one day - here's hoping! Daddy's Favourite bit: It seems unbelievable that the DFC didn't catch on when this was the quality of the strips it featured. Beltingly good stuff, a wholly original take on the 'school' story and who doesn't love gigantic scrapping mechs! PleasepleasepleasepleasePLEASE somehow resurrect this Neill, it's superb! The Phoenix Comic by various awesome folk. 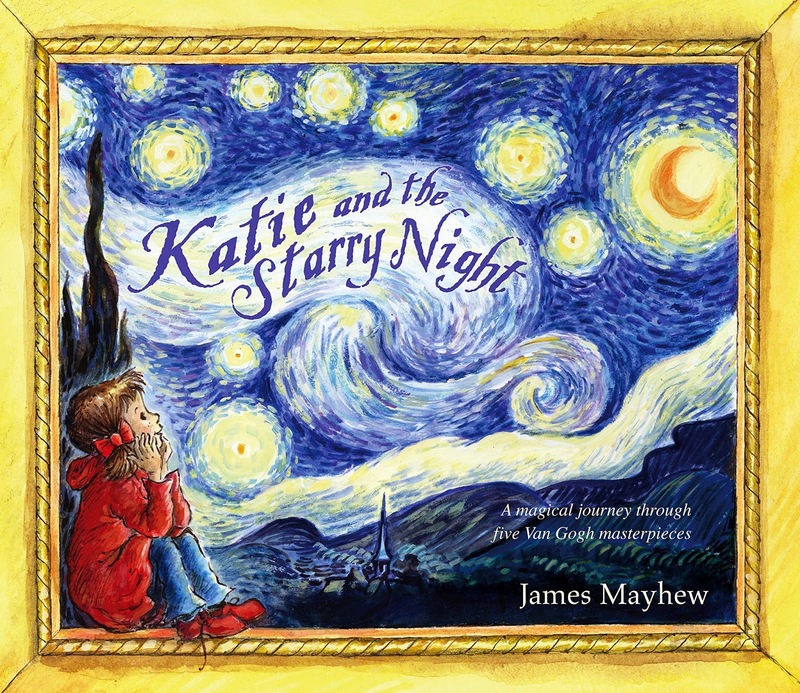 First of all, a huge huge MASSIVE apology to both James Mayhew and Orchard Books. 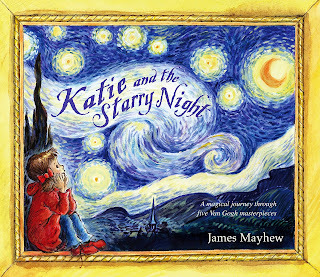 Somehow we managed to completely miss "Katie and the Starry Night" off our review schedule last year and I still don't quite know how that happened. But we're here to put things right, mainly because of the gigantic impact the "Katie" series has had on Charlotte - in particular this utterly exquisite celebration of the works of Van Gogh. James is an awesome campaigner for getting children interested in art from an early age. Through Katie, children can enjoy her stories and then go and investigate the original artworks that inspired them. From Van Gogh to Turner, British artists and international artists, traditional and modern, James has covered many movements and styles and it's been a truly awesome part of Charlotte's reading and learning experience for her to have a set of engaging and approachable books that talk about fairly hefty subjects in her own language. Katie visits a gallery along with her Grandma - and while Grandma sneaks off for a snooze, Katie's adventures in art begin! This time Katie finds herself drawn into Van Gogh's fabulous "Starry Night" and as the stars swirl around, mischievous stars flit away and decide to lead poor Katie on a merry chase through the gallery! Can she track them all down and return them to their proper places before the gallery attendant notices and Granny wakes up? She's going to need some help! Katie finds herself quite literally immersed in Van Gogh's world as she enlists the help of two lovely ladies (and a ladder) from "Olive Picking", as well as some rather canny fisher folk too. Stars are not easy to catch and the last one evades her grasp. It's time to borrow something else from a Van Gogh Painting (and this was definitely my favourite bit as Katie nabs that infamous chair from Van Gogh's "Bedroom in Arles". One day we'll take her to see the real painting in the Museum of Modern Art in New York, and we'll probably bring James' book along too! Charlotte's best bit: Katie enlisting the help of the lovely olive picking ladies with their big ladder, and absolutely ADORING "Starry Night"
Daddy's Favourite bit: Such a genius set of books that positively engage children's imaginations and curiosity, encouraging them to discover the wonderful world of art and the artists and works therein. Utterly beautiful book, hugely inspirational! More from Julia and Axel on the blog this week as we take a look at the fabulous Acorn Wood series. Printed in a neat mini-sized hardback format, these pocket-sized and charming tales are adorable and fun - and regular readers of the blog will know just how much my curious 6 year old loves lift-the-flap books. Rabbit is sleepy, and all she wants to do is take a nap. But try as she might, rabbit just can't get any peace and quiet, other animals are being FAR too noisy! 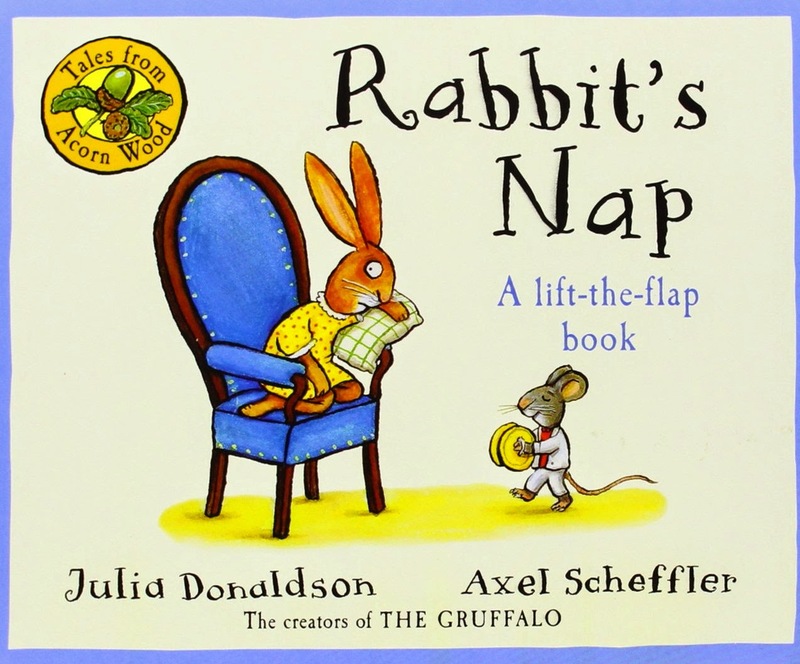 Little ones are encouraged to investigate what's keeping rabbit awake as each page spread has hidden flaps to lift and explore. The book's sturdy construction can stand up to a fair amount of punishment even under the most fidgety little fingers - it also means it's the perfect book for little ones to take away with them on holiday or to read in the car. We love Salina Yoon's stories, full of beautiful little observations and wonderful emotions. 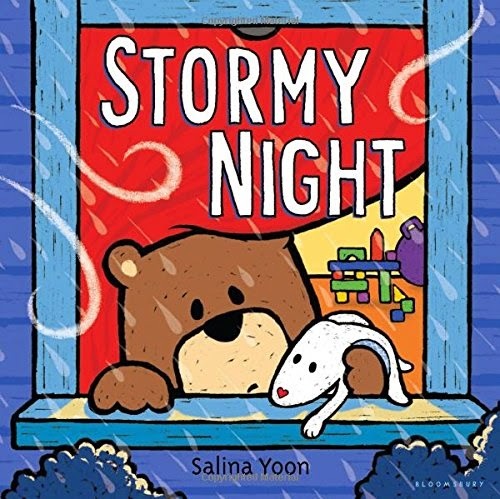 We've previously encountered the little bear in this story in Salina's "Found". He's back (with his cuddly little rabbit friend in tow) for a tale that may be all too familiar to parents - what happens when the dark night closes in and your little one just can't settle? Bear lies awake listening to the howling wind, the beating rain - and no amount of cuddles from his bunny pal are going to settle him at all. So it's up to mum and dad (and floppy the bunny) to point out that storms aren't really as scary as they seem. Once again it's beautifully observed and told, with those gorgeous illustrations common to Salina's other wonderful books. It's the perfect book for the really windy nights we've had recently, settling your little one down to a (hopefully) blissful and dreamy sleep. 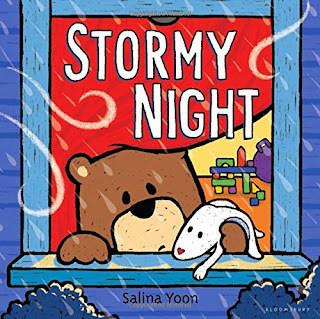 "Stormy Night" by Salina Yoon is released on 15th January 2015 from Bloomsbury Publishing. Daddy's Favourite bit: Wonderfully told and illustrated, just the thing for those restless nights where the weather beats at your windows and doors! Ahhh the best laid new years resolutions about healthy eating and a change in lifestyle. You know what though? Very little can match the sheer satisfaction of tucking into a really fresh crusty slice of bread, hot from the oven, slathered in butter and jam (or in Charlotte's case, a good dollop of chocolate spread). "Hooray for Bread" is the latest collaboration from a supreme children's book team, Allan Ahlberg and Bruce Ingman's books are quirky and sometimes surreal but in this tale the humble loaf of bread shares its journey from oven to table and beyond. How many uses are there for a loaf? How many people (and animals) can share a slice? 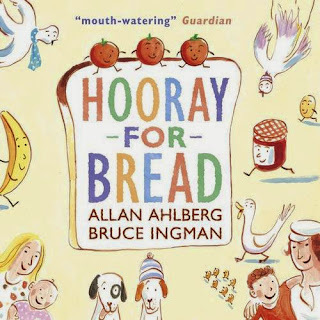 The story flows beautifully like a drizzle of honey atop a granary slice of toast, the illustrations are in Bruce's trademark simplistic but hugely effective style and a seemingly simple comestible becomes a book superstar right to the very last crumb! Daddy's Favourite bit: A simple idea made into a wonderful tale of imagination and wonder. Hooray indeed for bread! Celebrating stories, books and the endless imagination of children - how could we possibly resist a book that ticks all those boxes so wonderfully? We originally reviewed Charlie Cook's Favourite Book back in 2013 and for some reason it didn't score as big a hit with Charlotte as I thought it might. Now, "Charlie" is back for a timely reprint to celebrate its 10th Book Anniversary so I thought I'd try it out on "The Boss" once more. 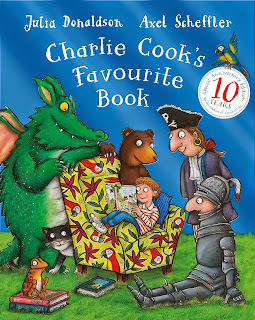 Charlie Cook tucks himself into his favourite armchair and reads a story that begins with the tale of a pirate captain. He's a swashbuckling cove who himself loves a good tale, reading all about Goldilocks - who is also reading HER favourite story, the tale of a gallant knight. 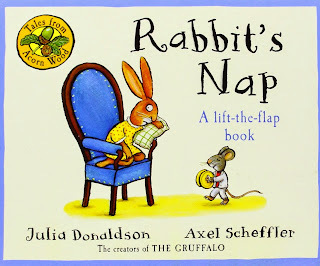 Stories flow between the various characters making up this lilting and lyrical tale (you just KNOW how brilliant Julia Donaldson's verse is to read aloud). Axel Scheffler's art is a delight as ever, and this time around Charlotte loved picking out the detail in each panel (particularly one fantastic spread with a rather entertaining story-based newspaper - and of course The Gruffalo popping up for a tiny cameo). The end-papers are a hoot particularly if your kids are as pun-obsessed as Charlotte is. So if like us you've managed to read The Gruffalo and The Gruffalo's Child, it's definitely time to catch up with this slightly more obscure but nonetheless fantastic book. Daddy's Favourite bit: Stories flow deliciously from one character to another before we arrive back with Charlie, and his soaring and colourful imagination. Brilliant and happy 10th Anniversary to a gorgeous book! Like this? We think you'll also love these too! Reminiscent of those classic Ladybird books that folk of a certain age will remember fondly, the Sterling Silver Penny range are also lovingly retold and presented with new illustrations - bringing these classic fairy tales to life for a whole new generation. Short enough to read one or two before bedtime, and long enough to keep your child enthralled, they're fantastic and well worth picking up either as a collection or individual stories to suit your child's tastes. 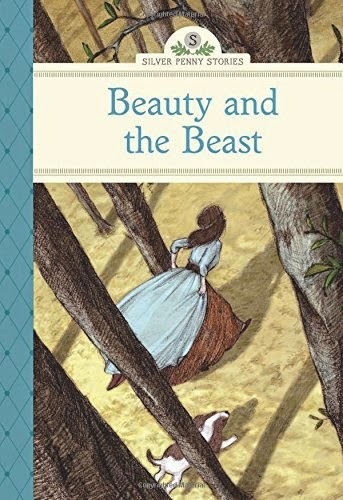 Charlotte's best bit: Charlotte proclaimed the Silver Penny "Beauty and the Beast" to be "The PROPER version!" - High praise indeed! Daddy's Favourite bit: A great little pocket sized pocket money range of fairy stories with something for everyone! Like these? You'll also love these! My mother said that I never should, ever go down to the deep, dark wood. The little girl in this story didn't heed silly advice like that, and as the story opens it feels like it could be yet another "Red Riding Hood" tale. But bear with it (or should we say "wolf with it") as this deliciously dark little tale has a neat little twist or two all of its own. 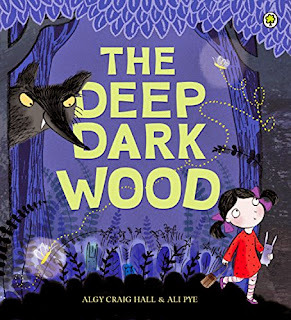 It does feature a big bad wolf, it does feature a seemingly innocent little girl all on her own, and there is lots of talk about scoffing and eating by the aforementioned wolf but there's where the comparisons end as the tale unfolds with a riotous end. Of course we're not going to ruin that ending for you, but appearances can be deceptive so as the little girl and her wolfy friend fend off all the other denizens of the deep dark wood, it's quite awesome that as time goes on, the wolf seems more frightened than the child! Nice that! 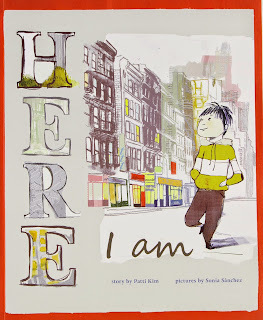 Neatly told with lots of brilliant read-aloud bits. Dark enough to make Charlotte cuddle up close when reading, but laugh her head off at the end. A great early start to our new year's 'dark' list! Charlotte's best bit: Is the wolf really going to scoff the little girl up, every last bite? Daddy's Favourite bit: Great to read aloud, and a belter of a neat twist at the end. Love it! 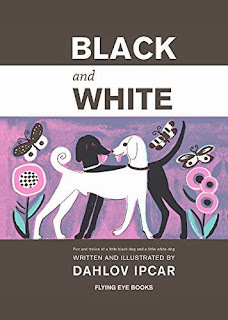 Flying Eye are doing an absolutely wonderful job of reviving the works of one of the most pivotal US children's author-illustrators, the awesome Dahlov Ipcar. Her works were way ahead of their time, and are still as vital, vibrant and in this case extremely relevant today as they were when they were first written. "Black and White" was published at the height of the American Civil Rights Movement - and it's a subtle expression of that movement's aims and means that feels like it's still needed over 50 years on. It's the tale of two energetic pups, Black and White, as they play together and experience the world together - each with a subtly different outlook on life but the firmest of pals who share everything and spend happy days doing all the things that dogs love to do. Even when they escape to their dreams, they are happy and full of joie de vivre, and best of all they can't wait to meet up the next day to tell each other all about their dreams. Seeing Ipcar's works restored lovingly by the Nobrow / Flying Eye team, ready to bring to a whole new generation, is truly wonderful. Her stories have broad appeal, so children of Charlotte's age will appreciate the happiness that exudes from each page - and then when she's a little older the conversations that the book evokes can delve into the reasons behind the book too. Stunning artwork keeping with the theme of black and white, with subtle colour additions throughout make the book eye catching and attractive, and Dahlov's superb rhymes (and delicious repetition) make it a joy to read aloud. This is a timely release, particularly with what's happening in the US and here. Children's books that impart messages like this are so vitally important, well done Flying Eye for realising that importance and bringing back to life such a stunning book in such a fantastic way. Daddy's Favourite bit: The message in this book is as vital, as relevant, as sorely needed now as it was back in the 60s when it was first published. Absolutely stunning book, perfect timing for release. Definitely do not miss! Welcome to Read It Daddy 2015! We're back, shouting and squeaking about brilliant new children's books with a few old favourites thrown into the mix too. But to kick off the new year, we've got a brand new book - released just yesterday in fact, and it's a great way to start our booky year with a cracking book of the week! 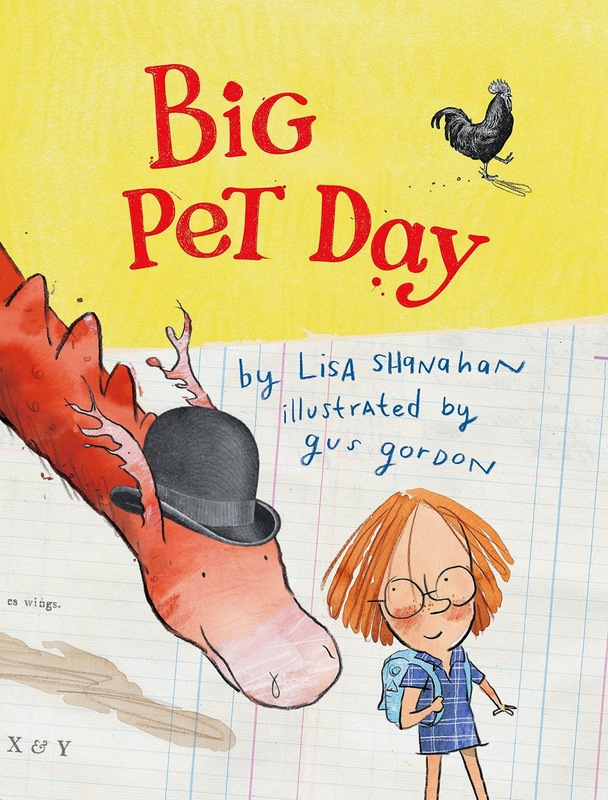 "Big Pet Day" tells the story of young Lily, a little girl who has a rather spectacular and special pet. It's pet day at school. Most kids bring in the usual pets - puppies, mice, even a fuzzy bow-tie-wearing ferret but not Lily. Lily brings in her pet dragon! Subtly well observed, "Big Pet Day" could almost be Charlotte's story. You see, we don't actually have any pets either (for various reasons but mainly to do with where we live) and Charlotte's school quite often has "Pet Blessing" days, so we often wonder whether she feels a little bit like Lily does in the story. Happy to join in, Lily's dragon is the most well behaved pet of them all so when class 'spoilt brat' Courtney scoffs at Lily's 'pretend' pet, she is probably secretly rather jealous - particularly when Courtney's own pet can't behave itself to save its life. The head teacher is ushered in to judge the "Best Pet" competition. Can Lily possibly win? There is so much to love about this book. For starters, huge thumbs up for being a book that celebrates diversity and inclusivity in Lily's class. Also, a double huge thumbs up with cherries on top for recognising just how wonderful teachers are (and Lily's teacher is fantastic, you'll see why as you tuck into this glorious story). Lastly a really huge blaring hip hip hooray for Lily, the sort of book character who is just so beautifully well observed that we couldn't help falling in love with her the moment we met her! There's definitely a bit of Lily in all of us, she's an imaginative and lovely little character! Daddy's Favourite bit: Wonderfully well observed, gloriously imaginative, a book that sings out to us - we LOVE it!